"MOOC - The Resurgence of Community in Online Learning," by Stephen Downes, got me thinking about MOOC is relation to the TLT Teaching Online for Beginners (TOL4B) MOOCOW that just concluded. The "OW" by the way, stands for "or whatever." http://halfanhour.blogspot.com/2013/05/mooc-resurgence-of-community-in-online.html?m=1 Below are some ideas I want to apply to TOL4B version 2.
trying to understand what type of design approach Stephen Downes used in the MOOCs he has offered. So far I have not been able to find an answer to my question. My sense is that a primary purpose of these early MOOCs was to create connectivist experiences and environments. There are people who suggest that connectivism is not a theory, I tend to agree. I think it's a way of facilitating learning and designing learning environments which focuses on networking within communities of learners. I was also fascinated by a recent article in Fast Company, "UDACITY'S SEBASTIAN THRUN, GODFATHER OF FREE ONLINE EDUCATION, CHANGES COURSE,"
http://www.fastcompany.com/3021473/udacity-sebastian-thrun-uphill-climb Apparently Sebastian Thrun is not happy with the low completion rates in Udacity courses and is partnering with businesses and colleges to use the content within the framework of a course or an organization. This model will also produce revenue for the company. Udacity courses are still available for free but if you want credit or a mentor there is a cost. Sounds like a realistic model to me. 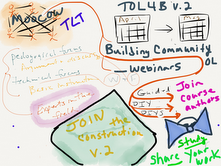 The TOL4B offered 3 paths through the MOOC: guided, DYI supported and DYI unsupported. Sounds similar to the shift Udacity has made.